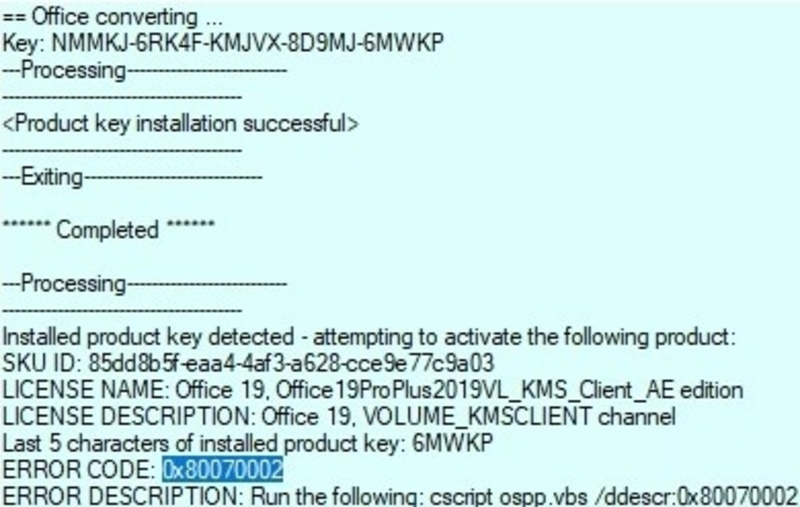 Hi, I get this error when I try to activate Office. I followed each step until in-place upgrade with no result. I stopped there because I wanted to ask: if I use that tool to update the windows, will it delete all my computer data? Klyxar Did you use activator tool? Yeah, after each step I tried to activate with the activator, but it shows the same error every time. But I stopped at in-place upgrade step, because I don't know if it will delete all my data or not. Klyxar I see that you used an activator tool, not my script. So I have no idea what to do in your case. I downloaded Office 2019 from your website (https://msguides.com/microsoft-software-products/download-microsoft-office-windows-os.html) and installed it. Klyxar You ran the batch file without admin rights. Please try again. I re-installed the whole Windows 10 and then it worked. Thanks for the script mate. One last thing, is it permanently activated? Klyxar The license is valid 180 days only but it can be renewed so dont worry about the period. Will it renew itself automatically? Or will I have to renew it manually using again the script? What about Office 2019 (I mean the code name)? Klyxar I see that it's just like Office 2016.